The theory goes that music in Iran is more genuine because artists get inspiration from the surrounding culture. You have to be Iranian, in Iran, and with Iranians to create Iranian music that has depth and lasting quality, they say. That's why so many musicians who were successful while in Iran, lost it when they left for Euorpe and America. Listening to Aldoush & The Human Exchange pretty much shatters that theory. I had read somewhere that Aldoush & The Human Exchange had won a major award in San Francisco in 1993 for their first album, "The Child Within". I had heard a track from it and I was looking forward to last night's performance at the "Freight and Salvage" in Berkeley. It was indeed sheer pleasure of the mystical kind. After the first ten minutes, I rushed home to grab my camera and prepare something for this week's cover story. Aldoush's music doesn't fit any of the standard labels. I'd hate to call it "World Music" since it would dilute its unique sound. Perhaps it can be described as a mixture of Persian folk, jazz and Turkish sufist. The result is mesmerizing -- and I'm not using that term lightly. The songs, many with Koorosh Angali's lyrics, are very modern and yet have all the soul of traditional Middle Eastern mystical music. Aldoush played the acoustic guitar, and traditional Persian string instruments, with a lot of heart and skill. But clearly, the band's star performer was Scott Hill. What he did with the clarinet was simply magic. Also, Jeff Obee was exciting and flawless on bass. Aldoush, who started singing at 16 and picked up the guitar at age 22 -- he's in his mid-40's -- was initially attracted to Western music. 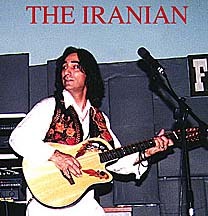 Ironically, he gravitated toward Persian music after he left Iran in 1978. "In 1987 I returned home. Upon entering Iran I became a child within a dreamleand. I was drenched in a waterfall of beautiful music and culture that had previously been invisible to me during my youth," he says. Aldoush has married Persian and Western music in a way that is neither out of place nor artificial. He is true to both cultures. Although his music is not for everyone -- some may find it repetitive and at times dragged out -- he has proved that you can make great music away from home. Maybe the key is to be at peace with the fact that you now have a new home and appreciate its great culture and music along with your own. The music clips below are from "The Child Within". You can order this cd online from XDOT 25 Productions.